Rock and Roll Hall of Fame guitarist Carlos Santanahas announced he will hit the road with his band across North America this summer for the Supernatural Now tour. The three-month, 29-date celebration will commemorate two of the most important milestones in the iconic guitarist’s career: the 20th anniversary of his groundbreaking, multiple Grammy-winning album Supernatural and the 50th anniversary of his momentous performance at Woodstock. 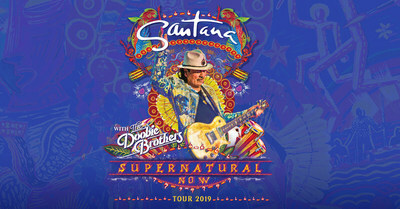 To reward Santana’s loyal fans for years of support and in celebration of the 20th anniversary of the award-winning album Supernatural, Carlos would like to share his latest masterpiece, a new full-length albumofhighly energetic and hypnotic songs, rhythms, melodies and grooves from Santana. Each pair of tickets purchased for this historic tour will receive this wonderful collection of new music as a special bonus.